35 Feet Super VGA + 3.5 Stereo Audio. br> Very popular for LCD Screens Projectors Etc. 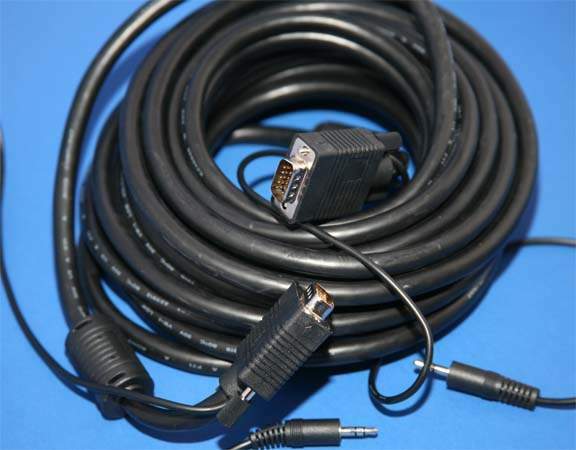 Super VGA 6ft M-M. Video Cable Used to Attach Hi-Resoultion Monitors. This cable has seperately shielded coax runs built into it to cut down on signal loss. Used also from video switch boxes on HI_REZ monitors. Works on all VGA and Up Resolutions. Cable works in all Computer Resolutions and HDTV Resolutions.